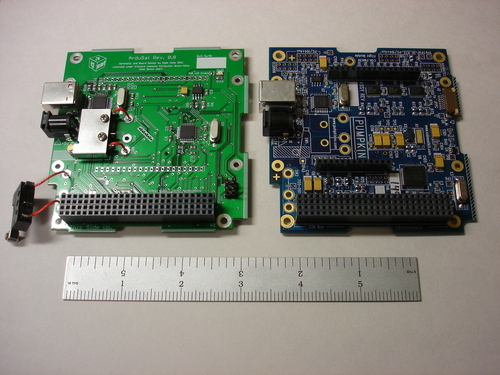 The original idea behind ArduSat was to act as a direct replacement of Pumpkin, Inc.'s FM430 flight module which is based around TI's MSP430-1612 microcontroller. After spending a couple of months working in CCE trying to program the MSP to utilize software serial and 1-wire protocols, our heads were thoroughly scratched, and I decided to design a Arduino based replacement. And in one week after receiving the prototype PCBs from Advanced Circuits, we were up and running. The ArduSat brings all of the wonderful features and ease of use of the Arduino into the Cubesat PC-104 form factor. In addition all of the chosen components have heritage making ArduSat a easy answer to hardware justifications and integration. H1/H2 pinout follows Cal Poly and Pumpkin, Inc's specs.